It’s 3:30 AM when the night’s relative tranquility is shattered by the ancient Landranger’s engine roaring to life. Early starts are the rule when monitoring endangered species in Mkuze Game Reserve, in South Africa, but there’s a particular urgency to this morning’s start. The day before, the day I arrived, was a transport day, and that meant the pack hadn’t been seen in the afternoon. 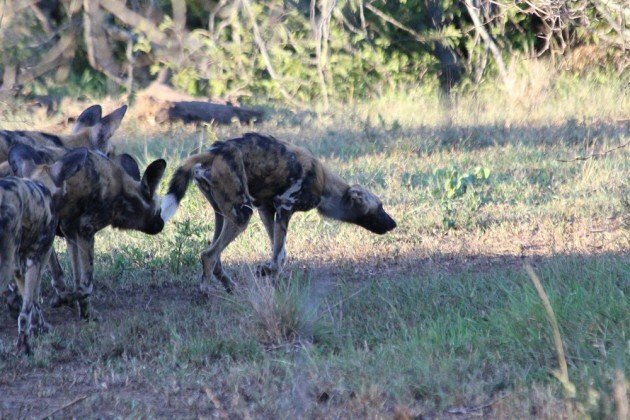 And the morning before the Mkuze pack of Painted Wolves, or African Wild Dogs, had been very close to one of the park’s few Lions, as far as tracking collars had told. And the two species were not inclined to get on, by which I mean that Lions will kill other large predators including Painted Wolves. And Pippa, our biologist, was very concerned. Her concern was well founded. We moved around the area where the dogs had been seen last but the radio tracking was not getting any hits, or was getting a confusing signal that was impossible to triangulate. After a few hours we guesstimated that the pack had moved south and after checking the shooting range (where the park rangers tasked with the unenviable responsibility of protecting the park’s rhinos practised their art) we joined the road to the less touristy southern part of the park. 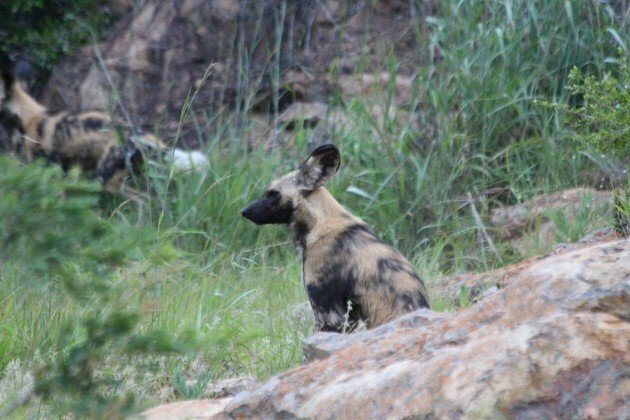 We hadn’t been on the road long before a shout went out that a dog had been seen, and we quickly turned back, and there was my first Painted Wolf in Mkuze. It was not a pretty sight. It was, based on a quick glance, a puppy, around 6 to 7 months old. Pippa knew all the older dogs but the youngsters took a quick check, it was a male called Falakhe, or Fala. And he was just lying there. After a while, clearly conscious of our attention, he tried to pull himself up and away from the road. Something was clearly badly wrong with both of his back legs, I’m no vet, but I would guess they had both been broken. Whatever had happened, he managed two steps before collapsing again. Pippa called the park ranger in charge of animals. After a while he made it out to check poor Falakhe out, and gave us the same conclusion we had reached. A Lion had attacked the pack, and this poor pup had taken the brunt of the attack. That call had deeper implications than a lesson in inter-species conflict among large savannah predators. Part of the monitoring that we were all out there to do was keeping an eye on the health of the pack. There are a lot of reasons why Painted Wolves are struggling, and many of them are human caused. Painted Wolves are very vulnerable to snares, snares which sadly are very common in many parks. 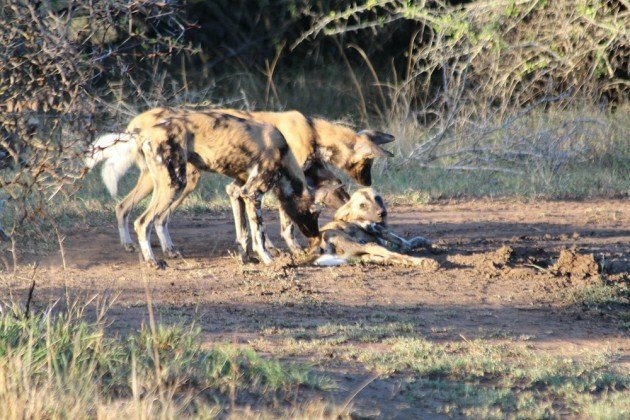 We tried to sight and count the pack twice every day so that if any of the dogs got snared we’d know quickly and could get a vet in to dart them, free them and clean up the wound. 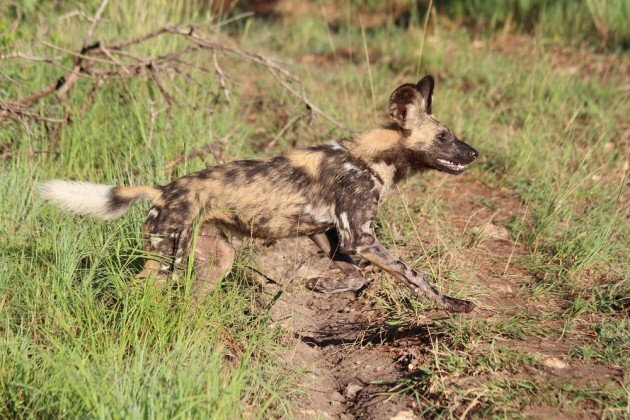 One of the other females in the pack, the beta female Lithe, was left three-legged after a snaring, but could keep up with the rest of them. Lithe, with a missing back leg and an anti-snare collar. Those collars save lives. Sponsor one here. We had to leave Fala to find the pack. 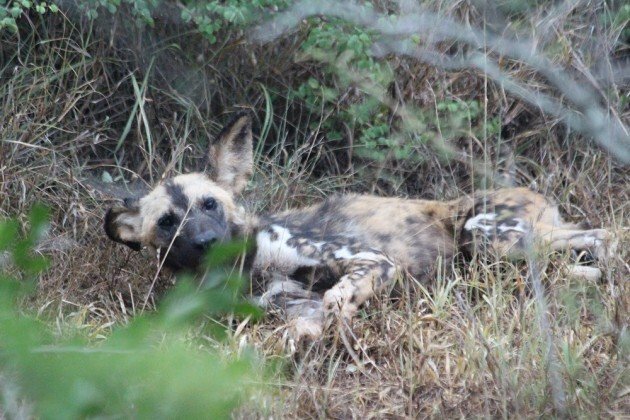 It took most of the rest of the day, but finally at around 5 we found the pack literally on the southern fenceline of the reserve, deep inside the hunting concession that made up the bottom of the park, twenty kilometres from where we found Fala. The area had much poorer roads and tracks, dense bush and more skittish game, but they were safer there from Lions, which is perhaps why they liked it. They certainly spent most of the time I was in Mkuze down there anyway, which made for long days. Fala, on our way back, was gone. Presumably lost to the wild. And yet… and yet. 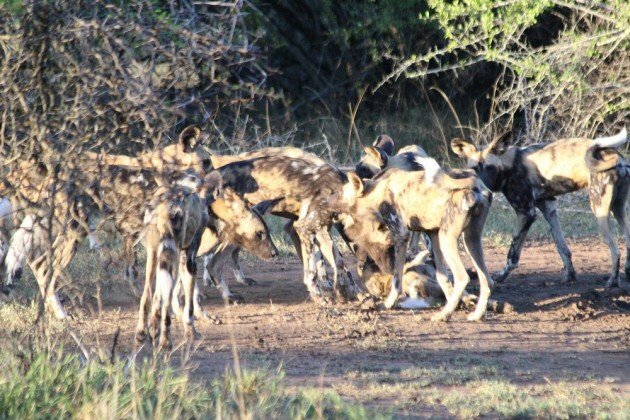 Three days later, in the evening, the pack went rushing past us in a small open area of dense bush, then veered left towards the main road through the park, still down south in the park. And they were very excited. Ecstatic, you might say. And in the middle of that excitement was a weak, badly limping, skinny looking runt of a dog. At first we were concerned that another dog had been injured, perhaps hit by one of the hunter’s cars (who were watching the pack as well). But the truth dawned on us as the poor thing collapsed surrounded by adoring pack-mates. It was Falakhe, who had dragged himself twenty kilometers on two broken legs past Spotted Hyenas, Lions, Leopards and jackals. We were stunned, simply stunned. No rest though. The pack moved on and he had to too. Even at this point I’ll confess I was pessimistic and sad. For one thing, magnificent as he was, he still had another kilometer to go that evening. Painted Wolves simply do not stop, and the pack had some way to go before they decided to bunker down for the night. But miraculous as his crawl must have been, I couldn’t see how he could keep going. And yet keep going he could. Three days later we saw him again. He was struggling to keep up with the pack, his back legs were clearly still causing him grief, and heas trailing behind a lot of the time. But his condition had gone from appearing half-starved to looking relatively healthy. Like other social animals, his family connections were keeping him alive, as his family was feeding him. He might not have been getting rest but he was getting food. And he kept turning up in the pack as the days went by, at least on the days we could find them. Fala, three days later, looked completely different. The last time I saw Fala was my last morning in Mkuze, two weeks after I had first seen his injured broken body lying under a bush. He was playing with his siblings, and apart from the occasional limp, you wouldn’t know anything had ever happened to him. He couldn’t be more different. 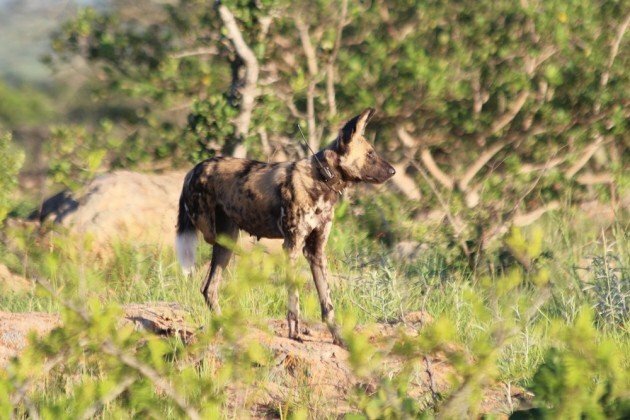 The extraordinary resilience and force of personality shown by Falakhe is, from talking to others working with the dogs, not rare in the species. A good example is the other Mkuze pack, a offshoot of the main pack that split off when the Mhuze pack got too big. 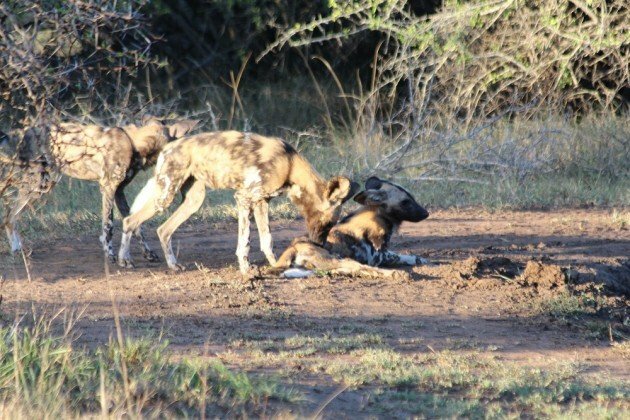 The adults were collared so the biologists could monitor them for a while, but then one by one the rest of the adults disappeared or were killed. This left some subadults and pups that couldn’t be located. Everyone assumed they’d die off without adults, and the repeated failure to find them seemed to confirm that. Then a year later they turned up again, and it seemed the subadults had managed to find enough prey to keep their younger siblings alive after all. I got in touch with Pippa last week, because I was writing this but had forgotten Fala’s name. I was afraid to ask if he was still alive, so I didn’t. I didn’t need to. Falakhe is still alive, as is the dominant male in his litter. This extraordinary dog gives me hope for his species. Give them half a chance and they will fight for their existence. Clearly it’s incumbent on us to give them that chance. Not Fala, but one of the many magnificent Painted Wolves of Mkuze. Support Wildlife ACT in supporting them. What an inspiring and interesting story. The resilience of animals is so amazing if we give them half a chance. Thank you, Duncan, for telling the story and much gratitude to Pippa and other dedicated biologists like her for caring so much.